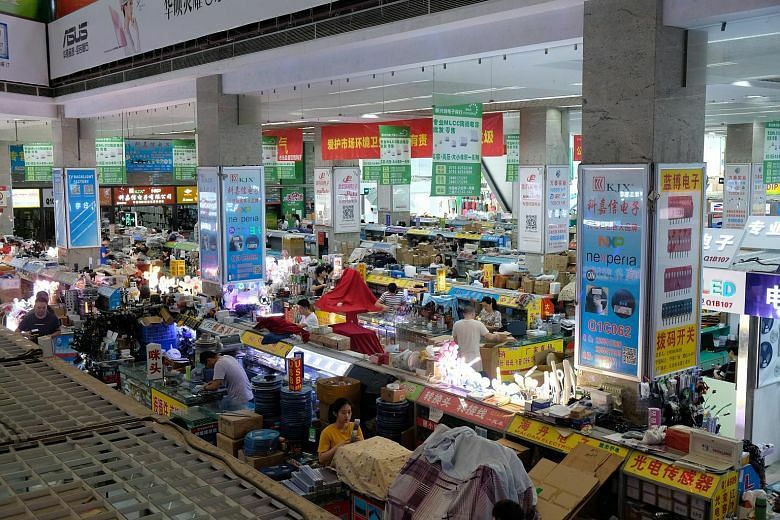 SHENZHEN - Mr Zhao Wanqiu walks through the maze of stalls piled high with electronic components at one of Shenzhen's Huaqiangbei electronic markets, wearing a look of expectation. The 24-year-old, who has been building machines, such as small motor-powered boats and cars, since he was in primary school, is looking for a small plug the size of a fingernail. Spotting what he needs, he places an order for 10 of the tiny components - parts that will go into a new circuit board that is currently being designed. 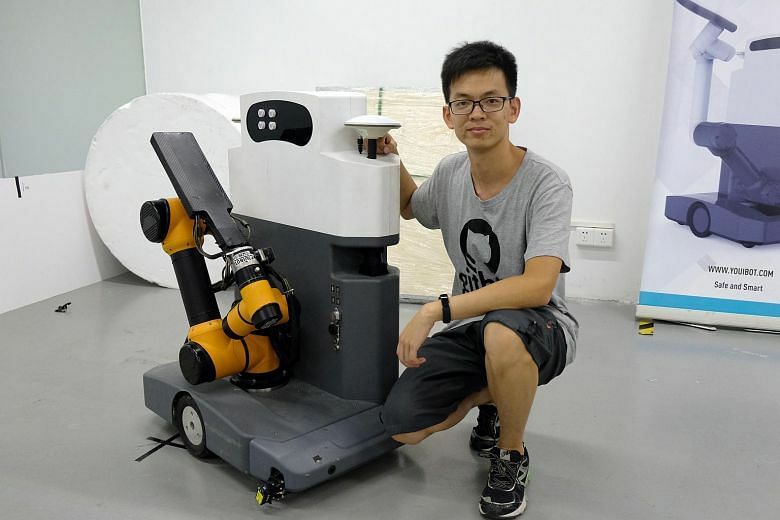 "An hour later, it will be ready, and I can come and collect it," said Mr Zhao, one of the co-founders of Youibot, a Chinese start-up making robots. This ease of obtaining virtually any electronic component would not be possible anywhere else in China, he said. Mr Zhao is one of the many hardware entrepreneurs who have flocked to Shenzhen in recent years, drawn by the city's concentration of skilled suppliers, engineering talent, and ease of obtaining components. "We can very conveniently and easily find parts and components we need, and so when we design new parts we can get them done quickly," said Mr Zhao. Among the robots his company is building is one that can check bus tyres for punctures - a process which currently requires workers to unmount and examine each tyre. The company is one of around 40 start-ups that Hax, an accelerator for hardware start-ups, accepts each year. 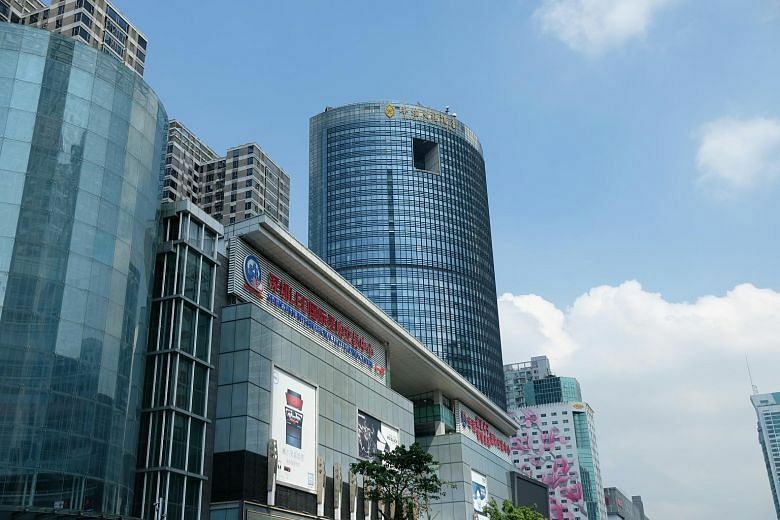 Hax is perched atop Huaqiangbei Electronic World, one of a half dozen hardware malls in the Huaqiangbei area. The accelerator, owned by American venture capital fund SOSV, invests in start-ups like Youibot, and brings them to Shenzhen, where it says their ideas can be developed faster than anywhere else in the world. The city's transformation from a place once better known for knock-off iPhones and other counterfeit electronics into a hub for innovation may seem startling, but this journey has been years in the making. The city's roots as a hub for manufacturing electronics began with the economic reforms in 1978, which attracted manufacturers like Foxconn, a Taiwan-owned contract manufacturer that makes Apple products among other things. Over time it became the manufacturing capital of the world, with 90 per cent of the world's electronics reportedly churned out by the city's factories. But growing out of this manufacturing power was a culture of "shanzhai" or counterfeiting, where manufacturers collaborated to make copies of expensive gadgets. He said many engineers and manufacturers honed their skills making copies of gadgets like the iPad in the noughties, sharing designs and improving on them. "If we didn't have those years of imitation, of copying, the manufacturing industry would not have been able to achieve its Spring of today," said Mr Wu, now chief executive of MeeGoPad, a company that designs and makes gadgets like mini-PCs. Over time the city developed the expert suppliers and engineering talent that has made it a hardware hub, said Mr Wu. Mr David Li, founder of the Shenzhen Open Innovation Lab - which links hardware start-ups from around the world with Shenzhen suppliers, drew parallels of the city's development to Germany in the late 1800s. Then, Germany was copying superior products made in the United Kingdom and selling them on the cheap in the UK and Europe. It forced the British to come up with the "Made in Germany" tag so consumers could better differentiate between products of the two countries, said Mr Li. "If you look at the development of modern industry, everyone started from copying. Now when you think 'Made in Germany', you think precision, high quality, good design and engineering, but it wasn't always so," he said, adding that Shenzhen is on a similar trajectory. Today the city is home to some of China's biggest technology brands including drone-maker DJI, carmaker BYD, and telecoms firm Huawei. Mr Abhishek Agrawal, from Singapore start-up Kinexcs, which makes medical rehabilitation devices, described the speed of development in Shenzhen as mindblowing. "Shenzhen is Singapore on steroids, things that would have taken me a month or two to do in Singapore I could finish in a day or two here," he said.